We went to Daytona Beach, Florida last month for a long weekend to escape the bitter cold of January. After a great day in St. Augustine shopping, exploring the old town, and visiting the Fountain of Youth, a lovely drive at dusk down A1A led us to Betty's A1A Cafe. My daughter has a fairly sophisticated palate for a twelve-year old and decided to try the soup of the day - Chicken and Artichoke. I managed to steal a taste and filed the idea away for another day. That day was today. I found the recipe below online at Mykel's Restuarant. 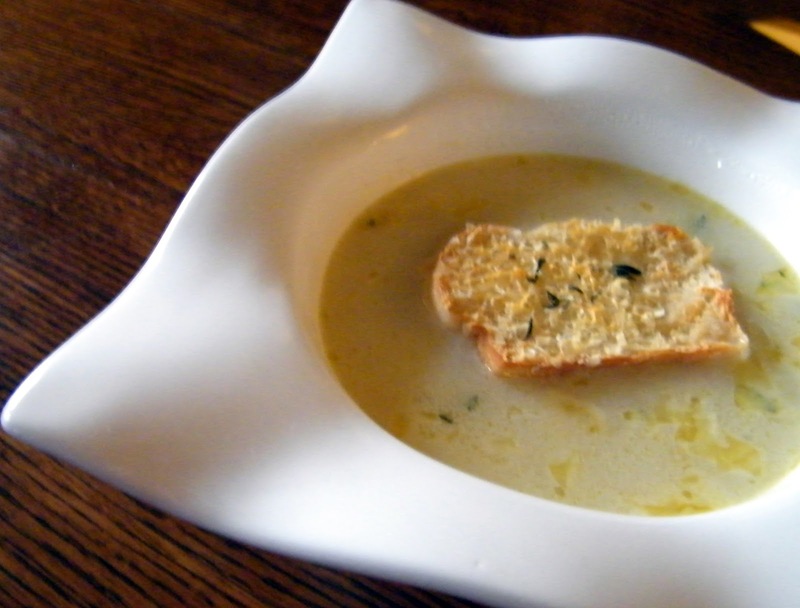 Now, Mykel's Restaurant is in Alaska which may be as far away from Florida as one can get and still be in the United States, but their Chicken Artichoke Soup recipe seemed like a match. And it is very close to the soup I had on the beach in Florida. I added Parmesan-Thyme toast on top for a finishing touch. The crunch of the bread added some texture and the thyme mirrored the thyme in the soup. The recipe was easy to put together and is simultaneously sophisticated and comforting. Give it a try for a new spin on chicken soup! Heat olive oil in dutch oven. Add chicken breast, onion, celery and cook until chicken is done and vegetables have softened. Add butter and cook until melted. Stir in flour and cook for 3-4 minutes to form a roux. Slowly add chicken stock and lemon juice, stirring frequently. Cook for 5 minutes. Add artichoke hearts and juice from artichokes. Add thyme, cream, and salt and pepper to taste. NOTES: The next time I make this soup, I plan on seasoning the chicken before cooking (salt, pepper, maybe some dried thyme). I also will reduce the amount of chicken stock by a cup or so and increase the cream to make the soup a little creamier and thicker. Your soup looks great can't wait to try. We just love Artichokes. The great thing about recipes is that no matter where you go, if they're good, they're good :). Thanks Netts Nook & Sophie! This is the best chicken soup and my kids (5 and 10) love it. They do not even miss the noodles in the traditional chicken soup. Thank you so much for posting this. We need to make double batches when we make this because we can almost eat this batch in a sitting. We just keep coming back for bowl after bowl. Thank you again!! !